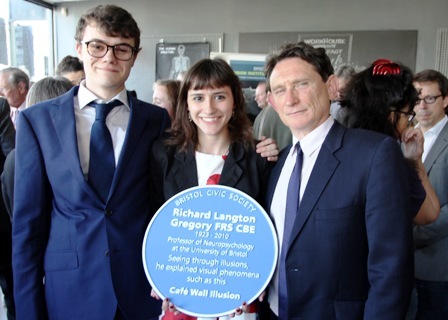 On 10th May 2017 a leading expert on illusions was honoured with a blue plaque. Professor Richard Gregory was a neuroscientist who spent more than fifty years investigating how our eyes and brain work together to perceive the world around us. He used optical illusions as research tools to investigate the way our brains process images. Below the plaque, the café wall has rows of tiles which appear to be sloping off at an angle, yet they are perfectly horizontal. 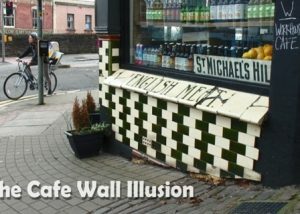 His explanation for it, a scientific paper entitled ‘Border Locking and the Café Wall Illusion’, was published in the journal Perception in 1979. The café, at the foot of St Michael’s Hill, is renowned among vision scientists worldwide. Around forty people, colleagues from academia and relatives, attended the unveiling ceremony.